Physiological Reaction to Nitrogen, Not Myth! This is a first for me in doing a paper, thesis on something that is actually very dear to me because of the late John Bennett who taught me the right way to dive deep & safe. I have given this much thought over the past few weeks to go about doing this and have come to the conclusion I will just write from what I actually know & is factual. For I am the one person who does this most days of his life and have experiences I can say more than most Deep Tech Divers today especially on our Beloved Air. I will start this with an actually Event a story if you like with a very dear friend mine whose name I won’t mention to save his embarrassment, Who I must say is very reputable and a fantastic Instructor too with vast experience. We had been tech diving for a few days already with depths ranging from 45 meters to 65 meters basically easy good tech dives. We always do our safety checks pre-dive and are very accustom to one others dive technique. So, if something unusual was happening we be more than aware. I always test my divers while on the Dive does not matter who that is with checks, i.e. we stop and will give a series of questions on my wet notes which could range from where are we? How Much Gas without looking do you have, etc. Or even a gas blow out to keep in Check our shutdown skills at depth too. Also, I will play the part of being unresponsive and without movement just lie on the bottom and count how long it takes for Dive buddy to recognize there is something not right. I must say all my divers without a second thought come and check me Nudge me talk to me, yes talk! Mark are you OK! then they take my Rolex off my wrist and the tech Dive computer of my other one then proceed to swim off laughing. All this being done and said it’s keeping their brains active thinking non-stop what IF… not just having a leisurely Mickey Mouse fun dive where most divers think its ok my Dive master is there if something should go wrong. Accident waiting to happen. To get back to the Incident we were off to Verde Island on a Beautiful Blue Skies calm ocean dive, where the drop of goes to about 73 meters but is renowned for extreme currents. This day my buddy was quiet on the 40-minute ride over just enjoying the breeze and the majestic scenes to the island with a pod of Dolphins swimming with us. I thought nothing of it and was very relaxed also. 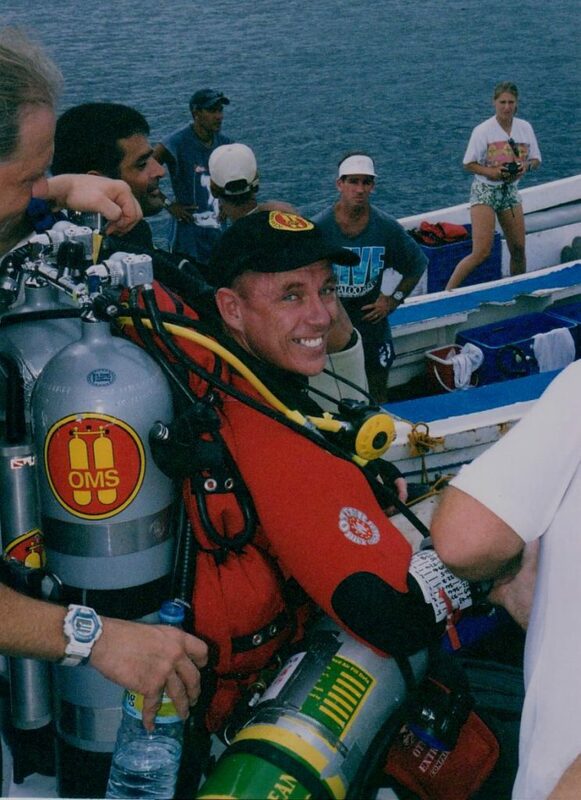 Just shy of the Dive site we prep our gear, we both have the same set up exactly what John Bennett used for his 300 meter world record dive in 2001, we don’t skimp on the best dive gear money can buy, Apex Regs and 94lbs OMS double bladder wings, back plate and harness no weights are needed. Both our stages are the same too, Apex 50’s with Swivel turrets for easy access and perfectly balanced for easy Breathing. It’s a perfect day and we very excited to do the dive, which in saying that I have done 100’s of times before. For me being honest 73 meters is deep yes don’t get me wrong and lots of people will say what about CNS PPO2 is 1.75 & PPN2 is out of the window but one can train your body your instincts with Programs like Narcosis Management where the whole dive is constantly checked from start to finish, one has no time because we are working down there. How do you know what it is if you have never experienced it oneself? 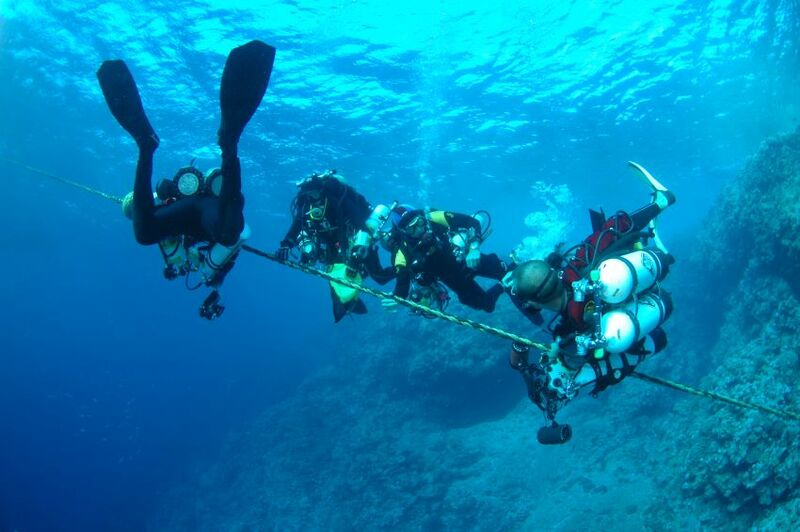 Technical diving is a constant learning curve and one should never get complacent. Frequent deep dives are the key watching feeling constantly. I know your saying what Feelings what are the Signs or Symptoms from the “Raptor Oo The Deep” or the German one I Like is Teifen Rausch “Deep Rush. As all Tech Divers know Nitrogen is inert and has no function in the human body but breathed at depth its absorbed into the fatty tissues (Lipids). As divers descend the water pressure on our bodies increase proportionally to our surrounding depth. A diver at 30 meters (100 Feet) underwater is breathing Air 4 times denser than at sea level, even so is the Nitrogen content 4 times greater than at the surface. These studies are still all controversial, exactly what happens and why some people have a greater immune to the effect of the Narcosis and some have symptoms shallow as 15 meters is unknown exactly. Consequentially when high concentrations of Nitrogen are breathed at Depth, the nervous system becomes saturated with Nitrogen and normal functions are impaired. 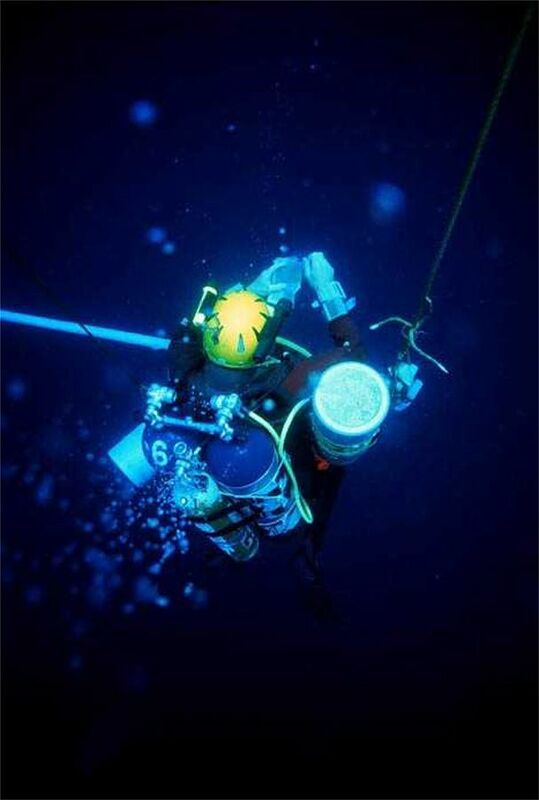 Each individual or diver has his or her own threshold or limit of susceptibility. 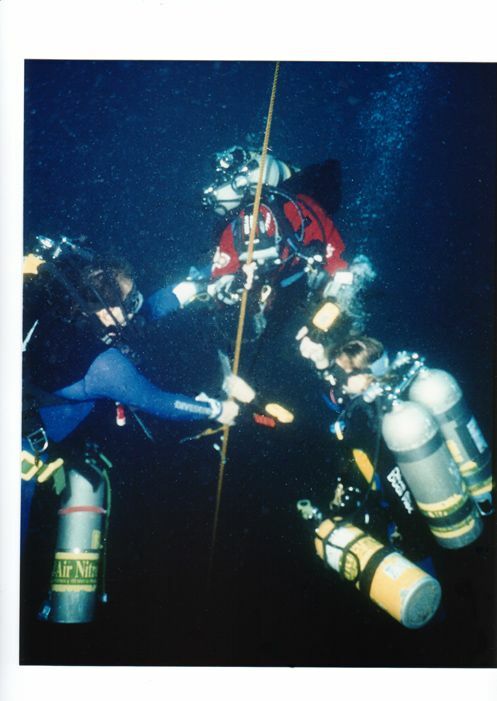 As the diver descends Deeper the impairment increases in severity, so just a simple skill at depth becomes more challenging and difficult compared to let’s say at 10 meters. So, a critical gas blow out at depth where time is of the greatest important and be able to deal with the situation within less than a minute and having the effects of Narcosis is pretty dam challenging. 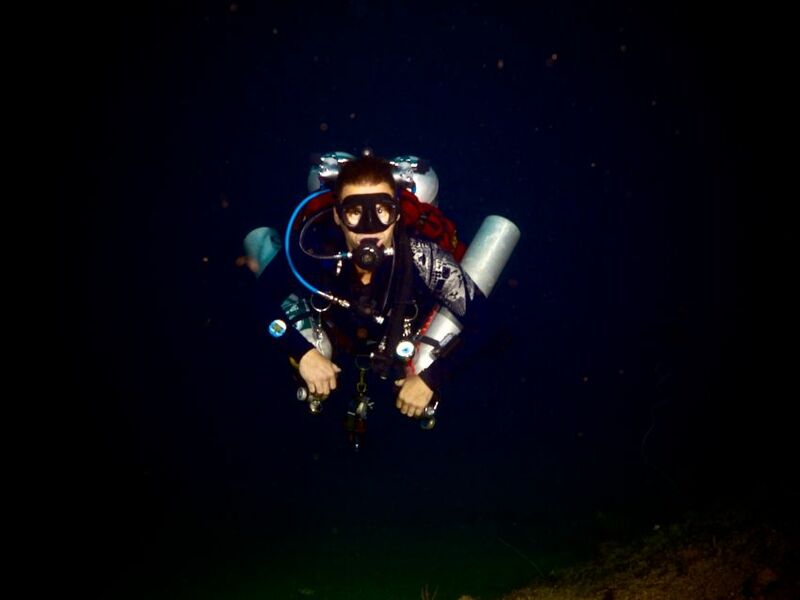 When the Diver ascends, the symptoms terminate with no apparent after-effects or permanent damage is done. Mild cases begin with a sense of well-being and light headiness euphoria and can be numbness and carefree feeling. Reasoning and Manuel dexterity may be impaired and slowed down. Emotions and instability and irrationality may then ensure an experience of wellbeing. 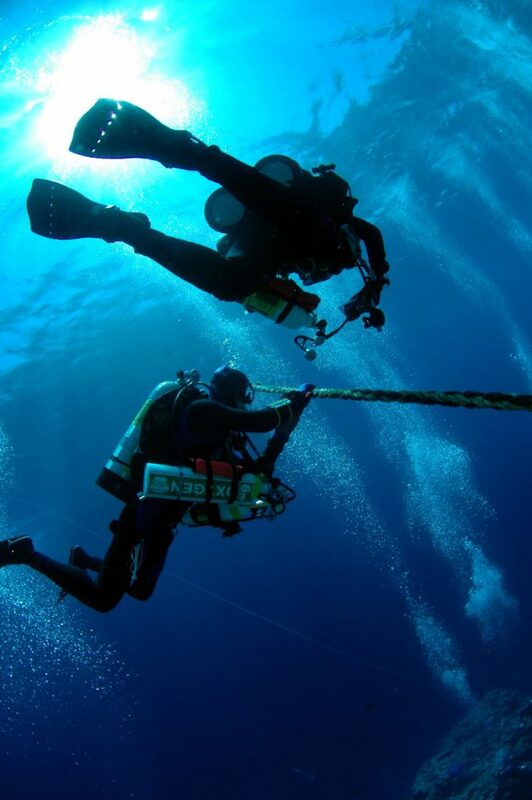 In cold and dark waters divers seem to encounter Panic, Fear & Depression. Unless the narcosis is severe the Diver may not realize that his rationality has been impaired in term not realizing his or her gas has been depleted. We hit the water descend to 5 Meters complete our checks for leaks and Valves are fully Open & Out of Air Drills. With all OK we both give a thumbs down signal, the water is warm clear and a blueness that we all love . The reef is busy with teams of fish from every color shape size one dreams of on a tropical reef. One of the most exhilarating feeling while Deep Tech Diving is the Descent, looking down into the vast blue watching for the bottom to appear being aware of my buddy and our surroundings. I am watching my Computer 28 to 30 meters a minute descent time, I always have my thumb on my Inflator button constantly on the way down, occasionally giving it a quick test pump to ensure all is working correctly. My Buddy is doing the Same we check each other about every minute with an ok sign or a flash of a torch light all is going well. I see the bottom coming into view about 65 meters and start slowing down even more. We are there I get neutral orientate myself with my buddy for a minute or so all is going as planned. We follow the drop off down slowly and keep movement to a minimum as I always do on deep dives, not exerting ourselves at all, we are on the right side of the wall and there is a slight current but not extreme, the reef is on our left and we reach the bottom of the wall at 72 meters. It’s been about 5 minutes into the dive, I check my Gas 185 bar, and we always use a turn point of 100 bar regardless of time, even though the bottom time is 8 minutes for the dive. I look around to check my Buddy! he’s not there, I scan the area up and down but can’t locate him, I look into deeper water and see him about 10 meters away from me swimming with his arms & legs like a frog. At first I thought he was just fooling around and having a laugh till I realize he is so disorientated with a wide-eyed look on his face. I swim towards him trying to get his attention flashing my light calling through my regulator but he is unresponsive to anything I do, he still swimming away from me. Now I realize we have an emergency at depth with my friend and Buddy, I catch up to him about 85 meters gently pulling on his arm letting him know I am there even though I know he can’t see me. He’s lost in a place where Narcosis is a reality and has taken over him. I’m calming him constantly with my gentle squeezes to his arm while guiding back to wall and shallower Depth, I can tell with his anxious look on his face that this could turn into panic any moment now but somehow he fights the instinct to panic, Again I am trying to keep calm myself and my mind is racing at 100 miles an hour, keep calm Mark all will be good. I check both Gasses and start to work while the training kicks in after many years of Deep Air Diving. We are now about 40 meters and have a long Deco in front of us but I can sense that my Buddy is coming around again slowly, he is now responding to my signals and his panicked look is that of WHAT JUST HAPPENED? I knew perfectly well what just happened. We finish our Dive without another hitch and with no apparent affects to my buddy he was back to his old self again diving like a pro, I could not wait to get back to the boat to analyze what just happened and grill his head what he thought, felt, saw etc. and to make him realize how close he was to dying. That being said I was thinking there must have been another reason for this biggest Narcosis hit I have ever seen. We have done hundreds of dives together and to these depths too with no apparent affect as it was on this Dive. We are back on the boat all is safe gear off hydrating, before I even ask my buddy he says that he so sorry for what he had done and that was irresponsible and extremely dangerous for both of us.! I asked him what happened? in which he replied I had too much to drink last night …. ! One can imagine what I said next. He told me he could not see anything no orientation and no idea where he was, had no recollection of what I did to him and can’t remember the assent to 40 meters where he came back to normal. I explained to him what happened down there but his mind was totally blank. He would have died. To my unknown knowledge of the night before and consumption of Alcohol, Biggest course of DCS and Narcosis Dehydration, Its Synergistic meaning one is more susceptible to DCS & Narcosis 10-fold. Every dive we do is a risk we accept those risks, we push our limits in this day & age it’s a normal human instinct to do that, Not just in Diving but in all activities, we want to know we want to see, we are curious as a race and with technology racing away in this day and age give us new possibilities too push the envelope even further. Deep Air Dives have no room for complacency or being irresponsible DCS & Narcosis is a reality people will get bent and get narked even with all the knowledge we have and training. No one person is the same and we all react different and so does our bodies. We cannot say 100 % that you won’t get DCS or a narcosis hit, I have no idea what you did the night before but expect you to trust me as I do you and be responsible thinking diver a Professional. I have learned from this and will go on learning in every dive I do with every person I dive with, I will use this Incident in a positive learning way and not a negative way. My Trust and me had been violated and even more so I was disrespected, it’s Sad I know but he has learned I have learned, so a bad thing ending up being a positive for both of us. We are today even better buddies plus hey he doesn’t drink anymore. its net of wonder forever.” (Jacques Cousteau).